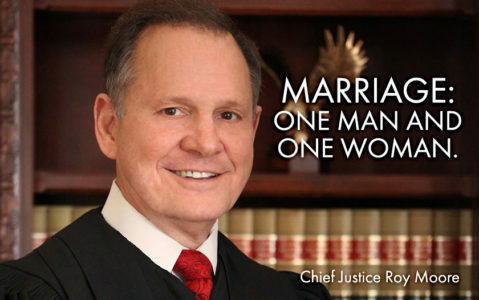 Chief Justice Roy Moore of the Alabama Supreme Court was suspended for upholding God’s marriage. Homosexual activists don’t like him. So, please send your message of support to Chief Justice Roy Moore. He defended traditional marriage. He defended the Gospel. He exercised properly his authority to defend Natural and Divine law in Alabama. You and I must encourage good leaders like Chief Justice Roy Moore. Spread the word and keep America as One Nation under God! To: Alabama Supreme Court Chief Justice Roy Moore We support your defense of God’s marriage in Alabama. You are a good example of how leaders should uphold Natural and Divine Law. I stand with you. I pray for you. I think of you and encourage you to continue your principled fight against the homosexual revolution. God Bless you!